With the rowers working hard in the background, Eliza is sporting yet another hockey uniform, this time it is the Vic Park Panthers. Being finals season, I can only assume that Vic Park have just won the Classic League Grand Final. Eliza was so excited that she has bought some balloons, and even purchased herself a hockey stick! Did Vic Park win? Do you know the scoreline? 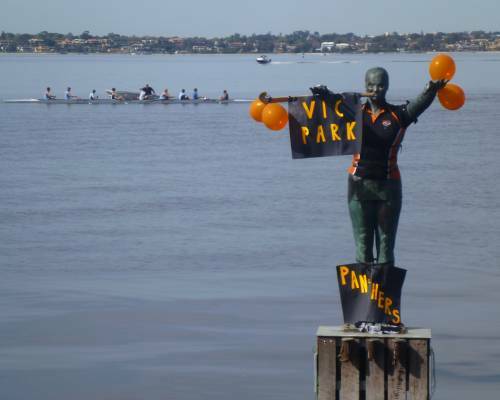 If you are you a member of the Vic Park Panthers hockey club or perhaps one of the rowers giving it all in the background, then post your comments below.